Autodesk 3DS Max format. Triangulated meshes. Originally from Maya. You can import this into sweethome3d. Blender file (.blend) rendered with internal. 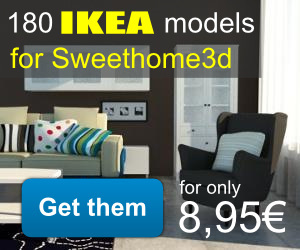 Sweethome3d files. You can import directly with correct size and textures. Sketchup files, the texture files are compressed within the file. Blender file with yafray setup. You need blender2.48a and Yafray. Blender file with yafaray setup. You need blender2.49b and Yafaray. I’m sure they’ll be took advantage of this site. hi how are you? excuzeme i want a few texture and 3d models can yoy help me?